From tiny garter snakes to strong-bodied rattlesnakes, a colorful variety of these reptiles call North Carolina home. The state has more than 30 known species, ranging in size from a few inches to 8 feet in length. Most of them are non-venomous, and all of them play an important ecological role in pest control. From North Carolina's mountains to its beaches, rat snakes are found throughout the state. Although their colors vary depending on region, in higher altitudes they’re predominately black with specks of white between scales. Their bellies are white near the head then follow with a mixture of white and black patterns to the tail. They are non-venomous, and true to their name, their main diet consists of rats and mice. They’re also excellent climbers and have been known to show up in chimneys and attics. Rat snakes are generally docile. However, if picked up or threatened, they will thrash and bite. Eastern king snakes have black bodies with a chain-like pattern of thin white stripes across their backs. They also have various patches of white on their black bellies. These non-venomous snakes average 3 feet in length. Since they are immune to the venom from such snakes as copperheads and rattlesnakes, occasionally these snakes are part of their diet. They also feed on rodents, lizards and eggs and are common around farms. 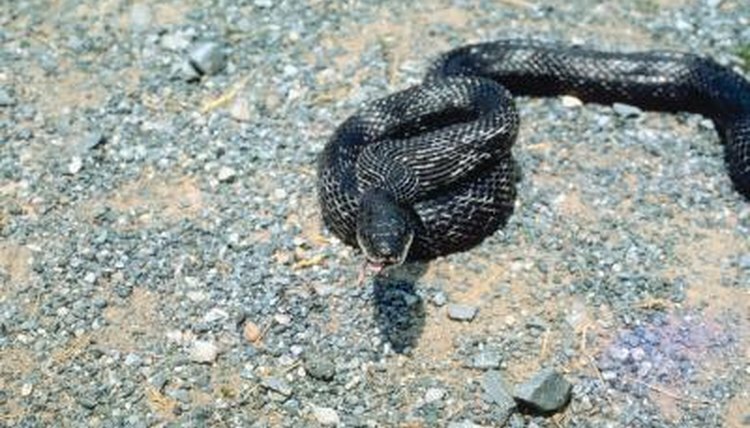 King snakes have a variety of habitats, but are mainly found close to water. Coachwhip snakes have a distinctive color pattern. Their heads are typically black, then the color steadily fades to nearly white at the tail. Growing to 8 fee, these non-venomous are one of the longest snakes in the southeast. Their scale pattern gives them the look of a braided whip, and they’re known for their speed. Consuming a diet of of mice and other snakes, they chase down their prey and swallow them alive. They live primarily in the coastal regions. Cottonmouths are one of the few venomous snakes in North Carolina. This snake's bit is highly toxic. Preferring swamps or slow-moving streams, cottonmouths feed on fish, as well as frogs and rodents around the water’s edges. Juveniles have black bodies, and they get their name from the characteristic white color inside their mouths. When threatened, their jaws open widely, revealing a large white mouth. Although perceived as aggressive, cottonmouths often try to escape before biting.